Ten years ago the Reverse Thieves blog/podcast site started their Secret Santa Project and it quickly became my favorite annual anime blog tradition. I did not actively participate the first couple of years because I didn’t have a MAL or equivalent account which would have made it somewhat difficult for a stranger to pick a new-to-me anime. (Being able to participate was the reason I started using MAL). I missed another year because I made the mistake – after several years of doing it correctly – of sending my desire to participate message to the wrong email address and only realizing this well after it was possible to be included. So, this is the seventh year I am participating and once again I found myself eagerly trying to determine the best series to give my Secret Santa recipient and hoping for at least one good series from my Secret Santa. My track record in receiving good picks has been very good. Will this year continue the string or did I receive a big lump of coal this year? The first season of Gundam Build Fighters introduces us to a world where a recently discovered particle can bond with the plastic of Gundam plastic models giving them the ability to mimic the properties of real Gundam machines while inside this particle field. Seeing these plastic models flying and fighting with real miniature beam weapons, guns, and swords creates a worldwide sensation. Sei Iori is a middle school student obsessed with Gunpla (the cute nickname Gundam plastic models have been given). His mother runs a model shop that specializes in Gunpla and his father was the runner-up in the second world Gunpla championship. The seventh annual world Gunpla championship is about to start and Iori wants to enter and win; the only problem is that, though his models are very well crafted which the particle field translates into giving his models better stats, he’s not good at piloting them. The only way to reach his impossible dream is for Iori to find a pilot with world class skills as teams are allowed to enter the competition. “… Santa has broken into your home, consumed your sacrificial offering of milk and cookies, and deposited 3 boxes under your tree. Pick at least one of your boxes then watch and review that show. 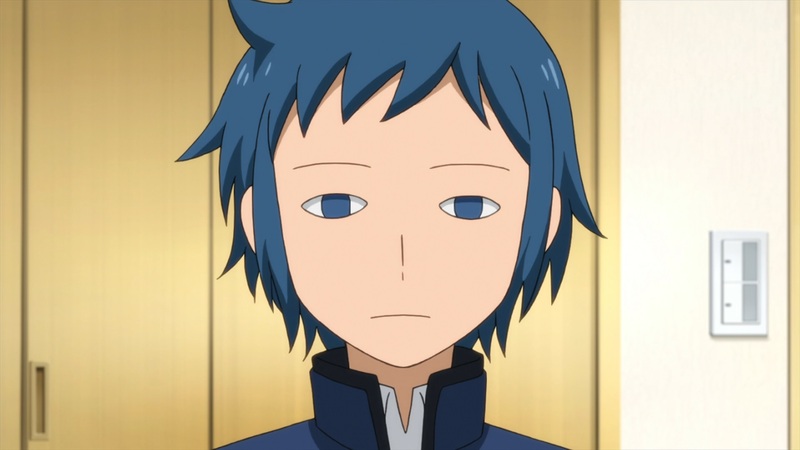 My eyes gravitated to Gundam Build Fighters immediately. I remember when the series came out and the number of people that really loved it. I originally passed it over because I’d watched nothing of the Gundam franchise and figured there wouldn’t be enough there to interest me. Since then, I attempted to watch Mobile Suit Gundam: Iron-Blooded Orphans only to see me drop the series 14 episodes in. 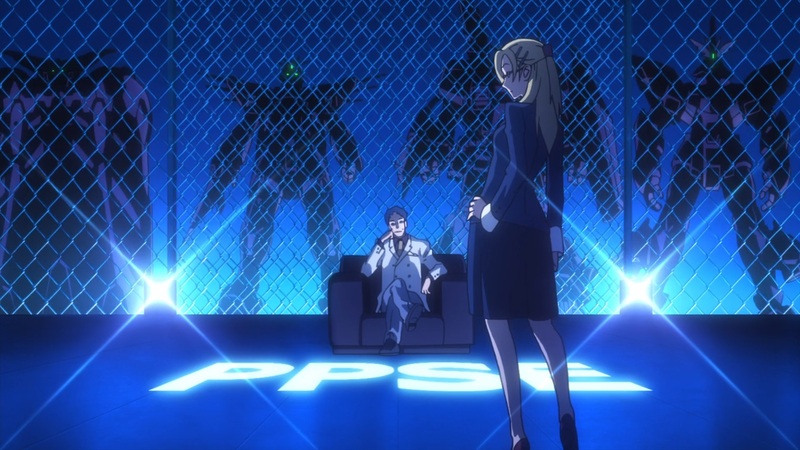 I found that series average-ish with neither the story or characters able to hook me in and keep me interested with the best part being the OP – “Raise your flag” by MAN WITH A MISSION – so when the seasons changed and a new crop of shows started and the OP changed I just never got back to episode 15 and eventually dropped the series. I wasn’t really enthused with giving the Gundam franchise another chance and decided to look at the other two series and would try to pick one of those. I looked at Kaleido Star and was at first confused with my Secret Santa over specifying the first season because MAL only lists a single series of Kaleido Star with a run length of 51 episodes. Further digging revealed that, beginning with it’s 27th episode, the show moved it’s TV airing time to Saturday morning and was given a new subtitle and featured a director change at that point as well. So, it was really two series that aired together. If MAL or Anime-Planet or Anilist (yes, because of MAL’s downtime this year, I’m now using all three) would have split the seasons up or if I had confidence that I could finish all 51 episodes in time so I could grade and mark it complete on those sites then I probably would have went with Kaleido Star. The first series was directed by Junichi Satou who went on to direct Aria and Tamayura among others and the second series was directed by Yoshimasa Hiraike who went on to direct Sketchbook ~full color’S~, AKB0048, Gugure! Kokkuri-san, and Wotakoi: Love is Hard for Otaku. Really can’t go wrong with either director. I turned my attention to gdgd Fairies. My vague recollection of this series was confirmed when I looked it up; it’s one of those “anime is weird” series that’s supposed to be funny. I have a very spotty record with these types of series. On the one MAL list I saw gdgd Fairies featured on – Top 15 Best Weird Anime of All Time – also contained seven series I’d already watched and I only really liked one of those seven. Not a very good record. Maybe my Secret Santa was right and I’d like the series if I tried it but I worried. If I picked gdgd Fairies and disliked it, I probably wouldn’t have the time to finish another series and would have a sole negative review for this year’s Secret Santa project. I despaired for a day or two as it looked like I didn’t have an obvious option before grudgingly deciding I’d give Gundam Build Fighters a try and if I somehow had the time I would consider gdgd Fairies with Kaleido Star being saved for some future time when I have time to watch the whole 51 episodes. 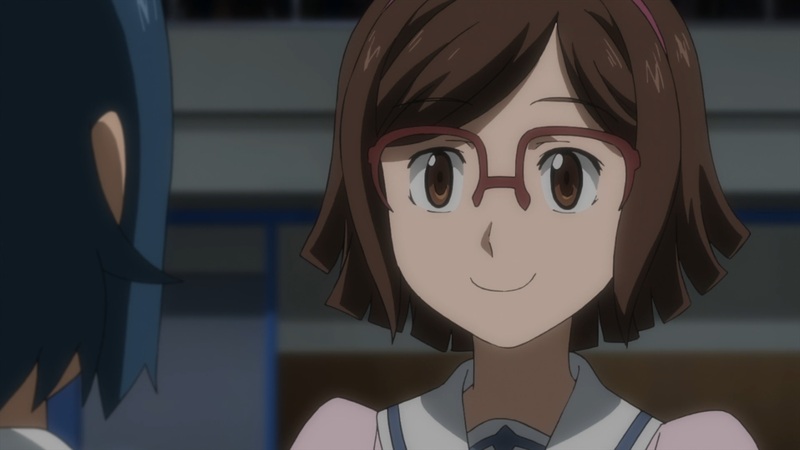 I really shouldn’t have despaired, even though I am not in the target demographic, Gundam Build Fighters turned out to be a pretty good series. What I should have despaired about was how to write this review. Normally there’s an angle or some sort of inspiration comes to me that guides me when I write reviews. I finished this series back on December 6th and have been pondering how I’d write the review. The show is so earnest and without guile about it’s love of the Gundam franchise and the building of Gunpla that I was having trouble imagining needing more than a paragraph to summarize my feelings for the show and that felt like a disservice to the show. So, with Christmas fast approaching, I sat down today to start writing and had an epiphany. 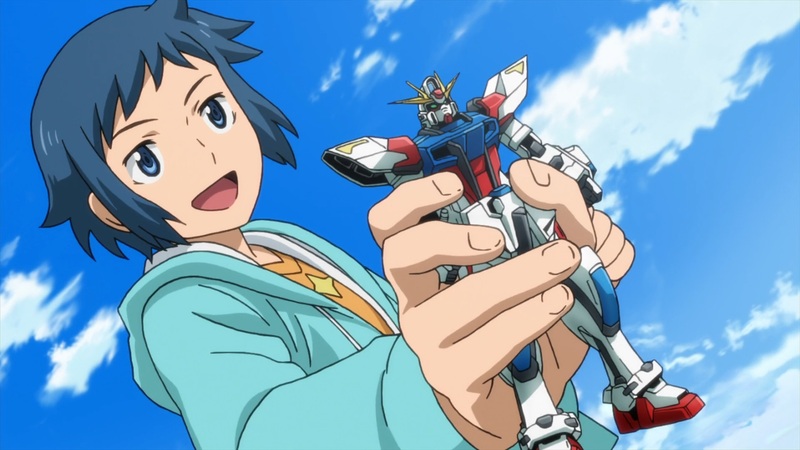 Wanting to write a long, detailed review would be the disservice to Gundam Build Fighters. The series overflows with the love the people who created it have for the Gundam franchise and for building Gunpla and it frankly feels wrong to sit and quibble and debate the punctuation, word choice, handwriting, or spelling of a love letter. What’s important is that it’s a love letter that properly conveyed it’s feelings and got a reluctant recipient like myself to reciprocate those feelings. As I already said, I’m not a fan of the Gundam franchise and I’m not a model builder of any sort. I did once help my Dad build a model of the B-17 Flying Fortress when I was like 7 or 8 and it hung in my bedroom for several years until we moved and it never got hung back up. 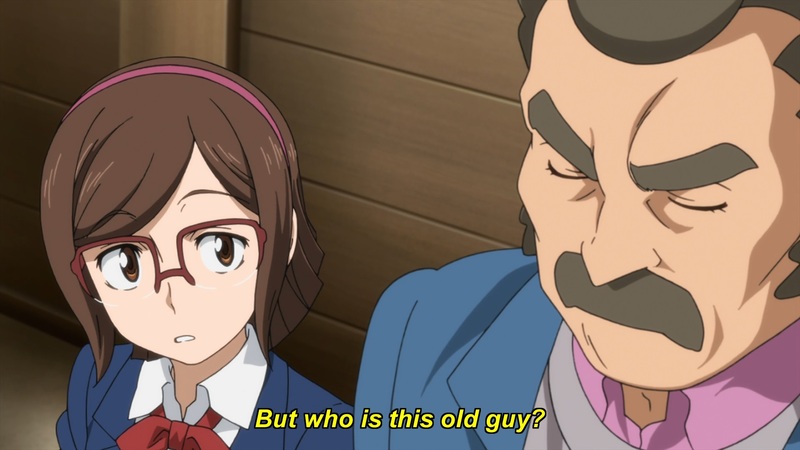 The story of Gundam Build Fighters is rather simple, with only a few minor reveals that don’t even qualify as “twists” and do little to change how one expects the story to play out. And after a few episodes I figured I’d correctly calculated this series appeal as I’d found the series only mildly interesting. If I’d watched it as it aired I wouldn’t have dropped it but it wouldn’t have been a title I prioritized watching. Then there were the issues I had with the show, among them was I had a hard time accepting that something as amazing as “Plavsky particles” were being used to animate a kids toy and there was a side character named Ral who had me worried for all the young male characters in the show. I began to wonder if I might need to give gdgd Fairies a chance when a weird thing happened. It took me over two weeks to watch the first 6 episodes but I slowly found myself wanting to watch more than the 2 episodes a day limit I imposed on myself to properly “pace” myself. I finished the series watching 6 episodes each on back-to-back days when I had a number of currently airing series I wanted to get too. I think the show’s charm needed time to work itself in. I realized the story was the best type of simple. Gundam Build Fighters had a simple story because that was the best way to communicate what it felt was most important to the viewer. A more complicated story would only muddled the show and made for a lesser experience. The cast of characters were interesting and their genuine enthusiasm over Gunpla gave them an authenticity that more than made up any perceived lack of complexity. 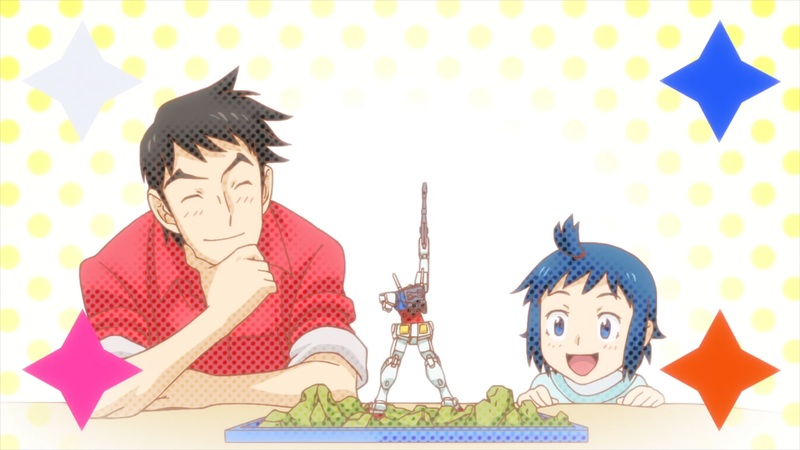 I grew to enjoy watching them geek out over the different Gunpla even though I knew nothing about the models and series they were talking about. 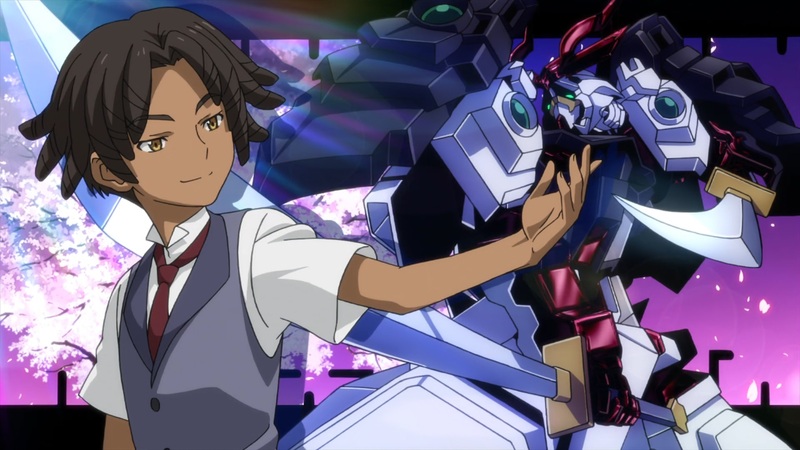 Nils “Samurai Boy” Nielsen, the American Gunpla champion was a favorite side character and Rinko Iori, Sei’s mom, is one of anime’s best moms. The production values were excellent all around, from the animation to the voice acting to the music to the directing to the OP/ED and definitely helped me become invested in the series. I decided I wanted to live in a world that “Plavsky particles” were being used to make kids toys move and not the next type of WMD and Ral turned out to be more interested in Rinko Iori, but kept his interest gentlemanly. I’m only disappointed that the future series in the Build franchise were not nearly as well liked by viewers and that I’ll probably stop here with the Build franchise, though, I think I might be willing to give the parent franchise another chance at some point. I did notice that the director of this first Build series – Kenji Nagasaki – hasn’t been back to direct which might explain some of the decrease in quality. I also don’t expect that he’ll come back any time soon because he’s been busy elsewhere. After directing Classroom☆Crisis he went on to direct the somewhat popular Boku no Hero Academia series. 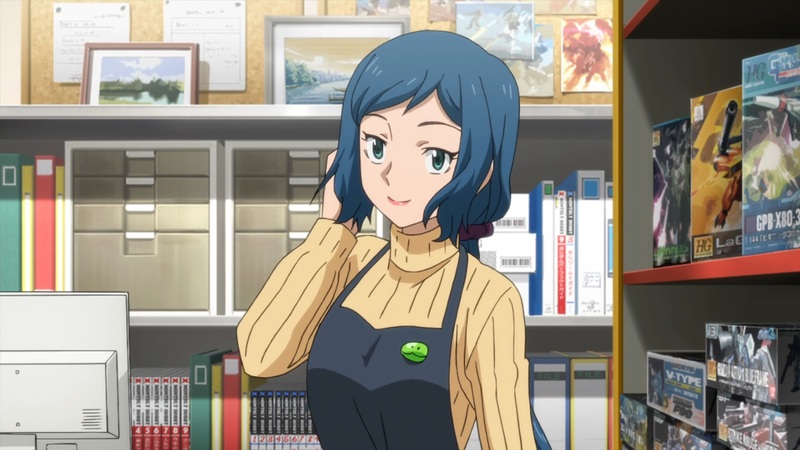 The important takeaway to this entire review is that Gundam Build Fighters shouldn’t have been able to draw me in and yet it did. That’s the mark of a great series and I thank my Secret Santa in recommending this anime to me. And, for not being a mere commercial to sell Gundam model kits, but, a refreshingly honest and heartwarming love letter to Gunpla and the Gundam franchise that even a non-fan can understand and appreciate, I recommend this series to anyone looking for an enjoyable, fun anime experience. Recommended? – Yes. It’s anime medicine that’s guaranteed to lift one’s spirit and recharge one’s soul. And to all my readers, Merry Christmas and a Happy New Year! 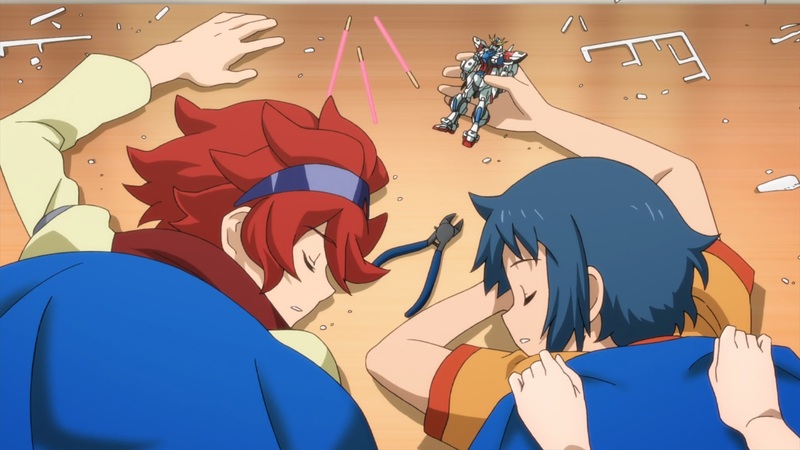 Here’s a few more screenshots from Gundam Build Fighters.